For the love of family and this iconic all-American game, PersonalizedThings by Exposures brings you this memorable custom wall decor! The Colorado Rockies has a passionate following in the Mile-High City's metro-area — and beyond! 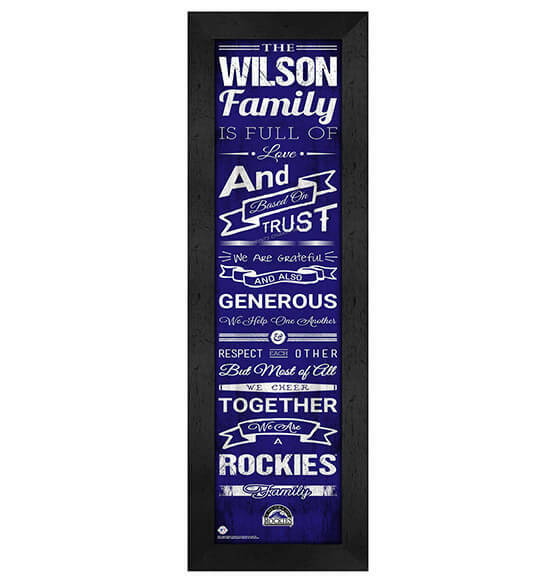 Ideal for birthdays, holidays or anniversary gifts, this Personalized Family Cheer Colorado Rockies Wall Art is a great choice for the superfan. This premium sports decor features the Colorado Rockies' team colors and logo alongside sweet family phrases that will warm the heart. Easily personalize this MLB baseball gift with up to 12 characters for an item your family or friends will truly cherish!